3. 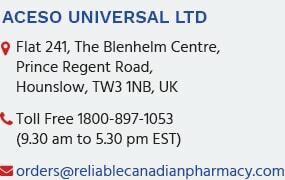 Is Reliablecanadianpharmacy.com a pharmacy? No, Reliablecanadianpharmacy.com is not a pharmacy. We are a online prescription referral service which provides our customers with direct access to affordable prescription and non-prescription medications. With our contracted International pharmacy and international pharmacy care providers, we provide our customers world-class service and access to a wide range of products and services. Our contracted pharmacies do not ship narcotic and controlled substances such as tranquilizers or opiate-containing medications. Reliablecanadianpharmacy.com reserves the right to refuse to accept orders for medications where there is a concern for potential abuse.